This piece is based on St. Brynach's Cross which is found at St. Brynach's Church at Nevern, a little village tucked away in the valley of the River Nyfer in Wales. It measures 2" in diameter and has a very nice weight. 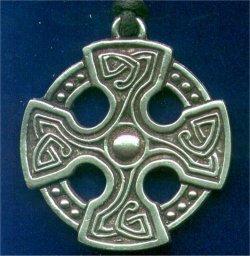 It is cast in LEAD FREE PEWTER. It comes on a 36 inch, 2.5mm black cotton cord.